The carbon cycle is the movment of carbon in and around of out envirment. In most cases carbon will stay still and not move for thousends of years. This is called a storage. If the carbon is released back into the envirment then it is called a source. If the carbon is taked out of the envirment and put back into storage then it is called a carbon sink. A example of a carbon storage is something like coal or charcoal. If it wasn't for humans the coal that we did out of the groud might never move. A good example of a naterial carbon sink is a forest fire. When there is a forest fire only part of the tree is burt up in the fire. Most of it gets turned into charcoal. Most of it will get burried undergroud and either get burred for thousends of years or the charcoal will get asorbed back into the roots of the tree. This will make the forest much more healthier and will quickly replace the trees with new ones. 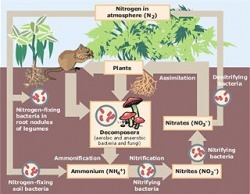 The Nitrogen cycle is no were as important as the carbon cycle in theroery but life would still not exist with out it. It is incredable useful for plants by helping them grow. Plants can't asorb this into the plant but has to get it from the water. Nitrogen is used in plants to grow and also it is also in DNA. With out it plants wouldn't exist and neither would the Ivory-Bill because its food, Beetles would die out. The cycle for phodphorus is very similer to the others exept for one thing. Phosphorus is not found naturly in the air and only in the groud water. The Ivory-Bill is in the Phosphorus cycle because it eats a herbivore, beetle. Beetles eat plants which get it from the water they use in getting food. Also if the Ivory-Bill did not have Phosphorus it would not have DNA, bones and protien.